August | 2014 | JUDDER! Good day to you, Judder crew! Apologies for the delay in communication – we’ve been very buys bees behind the scenes at Judder HQ, working hard and playing harder! Thanks to everyone who came out to JUDDER – THE MUSICAL! at the beginning of the month – it was our busiest Judder of the year and the dancefloors were really going for it all night! Guest DJ Ian DeadPunkBoy played two absolutely banging sets, and the atmosphere was wonderful from start to end – the photos and setlists are up at www.judder.org to help you remember what a banging evening it was! 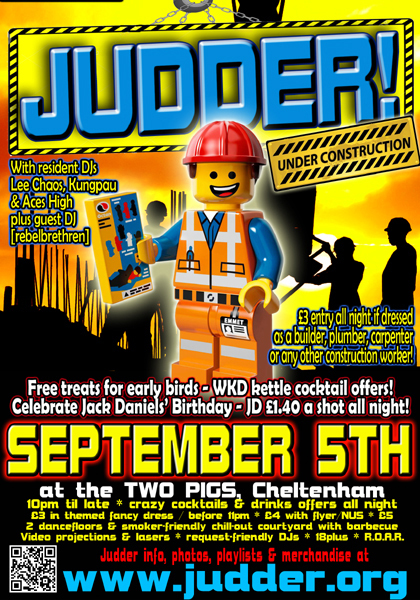 Your next chance to Judder will be our JUDDER UNDER CONSTRUCTION on Friday 5th September – come and help us build a brilliant club night! Discount entry of £3 all night if dressed as a construction worker, builder, plumber or any other trades person! Our guest DJ will be [rebelbrethren] who we are delighted to have back on the decks again, and we will also be celebrating Jack Daniels’ birthday, with JD being just £1.40 a shot all night! There will be treats for early birds so turn up nice and early to max out your Judder experience! Also keep an eye open for our new Judder Facebook page – we’ll be keeping the We Love Judder group running but hopefully you’ll now be able to tag Judder so that people will know where you’ve been having all the fun and come & join us!